Memorial Park Considered the ‘largest urban-park in Texas’, Memorial Park is located at Loop 610 Woodway, Houston where it’s surrounded by wooded areas. The center has lush foliage which makes it ideal for tennis players who want to take lessons in its peaceful countryside setting. There are a total of 18 courts available at Memorial Park, which are free to use by members of the community on a first come first play basis. You can also reserve a court 1 week in advance by contacting the pro shop. The park is open for training throughout the year even during winter season. Judson Park Judson Park is a fenced and secure tennis facility. The sizable,well-shaded area consists of a lighted tennis court that you can visit during the evening after work for lessons, as well as other amenities such as a playground for kids, walking path, picnic tables and BBQ grills. The main street is visible from the playground area, with just enough cars and pedestrian traffic to make the park feel safe. 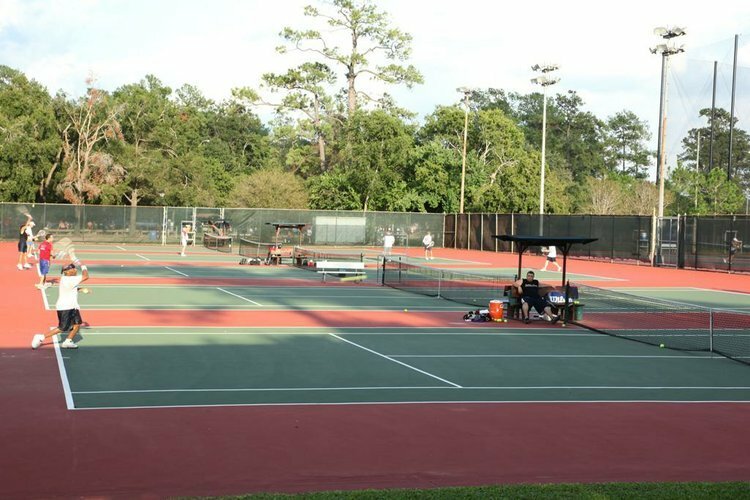 Spotts Park Covering an area of 16.24 acres, Spotts Park in Houston is a popular outdoor destination for most aspiring tennis players. For tennis lessons, it has 2 hardcourts that are lighted and open to members of the public. These facilities can be accessed by anyone regardless of their age or abilities, plus there are no membership fees for users.In addition to the tennis facilities, Spotts Park also has other amenities that players can use such as trash cans, benches and drinking fountains. Moreover, it’s only a short distance away from downtown Houston. River Oaks Park Also dubbed the ‘Pumpkin Park’, River Oaks is a public tennis center found at 2605 St. Houston TX. There are 4 tennis courts in this facility which are fully fenced in and therefore safe to use for both adults and kids. Additionally, there’s free parking available on the adjacent street. You can also sit under the giant oak trees after your tennis lessons and enjoy the park’s serene view. Westside Tennis and Fitness Center Westside Tennis Center is found in 200 Wilcrest Dr in Houston and covers an area of 16.5 acres, with 30 courts. 17 are outdoor lighted hardcourts, 6 outdoor lighted clay courts, and 4 indoor courts. Westside center is open every day from Monday to Sunday. With so great many courts that you can train at in Houston, it’s important to find a qualified tennis coach you can trust. Let Play Your Court Guide you to the perfect tennis coach for your Houston Tennis Lessons.